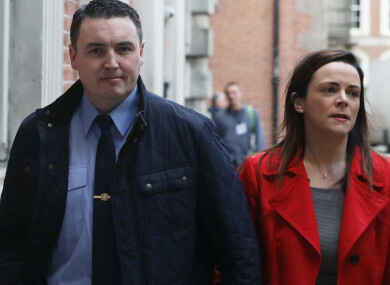 Garda whistleblower Keith Harrison with his partner Marissa Simms arriving at the Disclosures Tribunal in Dublin Castle. THE PARTNER OF a garda whistleblower who claimed he was subject to harassment and intimidation voluntarily left the home where she was living with him on three occasions, the Charleton tribunal has heard. Hugh Hartnett SC said that his instructions from his client, Marisa Simms, were that she was not thrown out, but had voluntarily left the home at night “on approximately three occasions” after rows with Garda Keith Harrison. Hartnett said that it was Simm’s habit to go to her mother’s home after a row. He also said Simms was not saying that Garda Harrison had threatened to burn her or her children. The tribunal heard from Simms’ mother, Rita McDermott, who made a statement to gardaí in October 2013 reporting the alleged threats made by Garda Harrison. McDermott said that she did not remember if she had told gardaí in 2013 that Garda Harrison threatened to burn Simms and her children, and she did not remember saying he “could drink a bottle of brandy while you’d blink”. McDermott said this was what she had meant when she told a garda investigator that she did say those things in a garda statement in 2013. McDermott agreed that a lot of what she had said in her statement was not what she had witnessed herself, but information she was told second or thirdhand by her daughters, Marisa Simms and Paula McDermott. McDermott said that when she first approached Sgt David Durkin about Garda Harrison, it was because she hoped he might get some form of counselling. She agreed that she had not mentioned counselling to Sgt Durkin, she “just asked to have a word with him”. Questioned by Mark Harty SC on behalf of Garda Harrison, McDermott said that her attitude to Garda Harrison had changed since 2013. She said that since he had gone on sick leave with the Garda Síochána, he was taking care of both his own and Simms’ children from her previous marriage. “He’s a very good stepfather, the children love him,” McDermott said. Email “Tribunal witness 'doesn't remember' saying garda whistleblower threatened to burn his partner”. Feedback on “Tribunal witness 'doesn't remember' saying garda whistleblower threatened to burn his partner”.